Wish I could say I had a great weekend but my week never ended. This weekend is my project's Go Live weekend. This means the office is working 24 hours and all the staff is split into 3 shifts. I've been on the 11pm - 9am shift since Thursday and this is likely to continue into next week. But things are pretty ok for me, I've been staying at Ein's place instead of the hotel this week, so its nice having a fridge and kitchen + other homely comforts. Still I am looking forward to flying back home on Thursday. 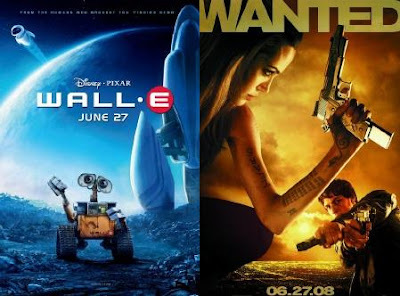 My biggest regret this weekend is missing out on WALL-E. The reviews are awesome and I've been in love with the trailer for 3 months. I sooo want a WALL-E stuffed toy and I've not seen the movie yet. But my comfort is in knowing that since I'm an hourly consultant, I'm getting paid for all the time I'm working, unlike the poor saps who actually work for my client. They've been putting in overtime for over a year since the merger with nothing more than verbal thanks. Oh and I did have one VERY bright spot this weekend. 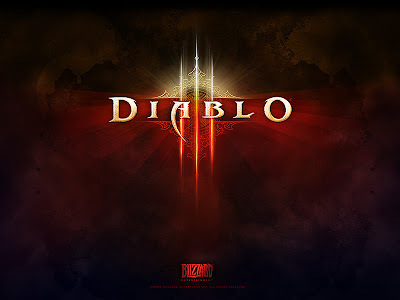 Blizzard finally announced that Diablo 3 will be coming out. 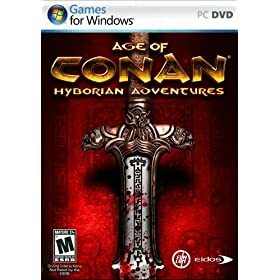 Diablo2 is one of the most successful computer games of all time and my personal favorite game. 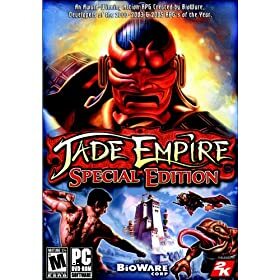 This shows how big a geek I am, the announcement of an up upcoming game which probably won't be released till 2010 was the highlight of my week. Had to share this. 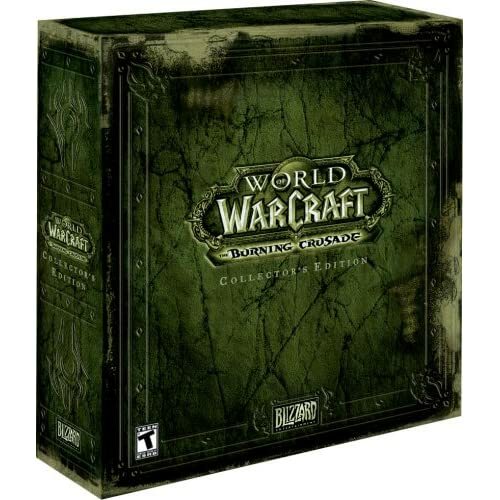 From now till 4th July, its the Midsummer Fire Festival in World of Warcraft. But even better is that this year they put in a whole bunch of awesome fun items. 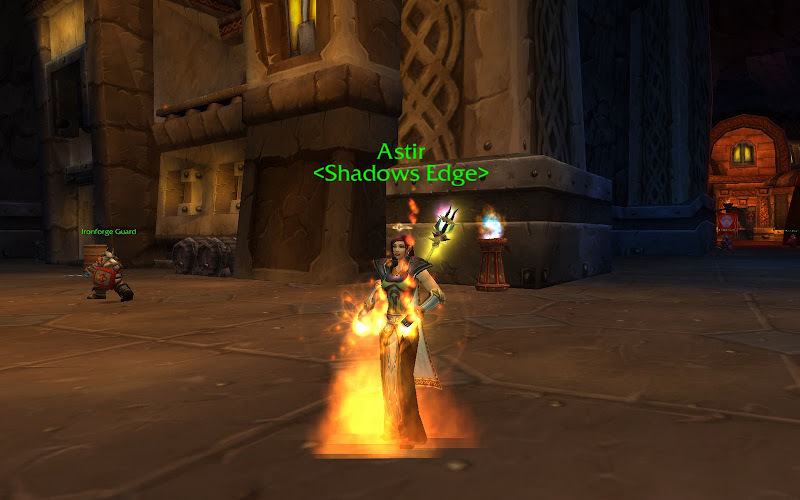 As you can see from the picture below, Astir (My Priest) is literally on FIRE!!! Thanks to the Sandals and Vestments of Summer. I just got my copy of Spore Creature Creator!!! SPORE is a new computer game that's coming out in about 2+ months. The game is basically a sims game but starts with ... a spore and having that spore develop into a creature, into a society, into a civilization and eventually intergalactic travel. Its essentially sim life. In the mean while, they just released the creature creator tool for $10, considering that this does nothing but allow you to create a creature, and is included in the upcoming game, this is an awesome marketing and money tool. Its also DAMN FUN! Not only can you create any and everything under the sun given time and talent, the creature you create is fully mobile, and you can take picture and videos and automatically upload them to youtube. Here's my first 2 novice attempts at creature creation. A Proto Human that needs a lot of work. Others have created much more realistic cavemen. But I think mine's cute. And my idea of a plant animal. I cooked dinner with Eins tonight. We shopped at Trader Joe's which is a kind of semi-health food grocery store. 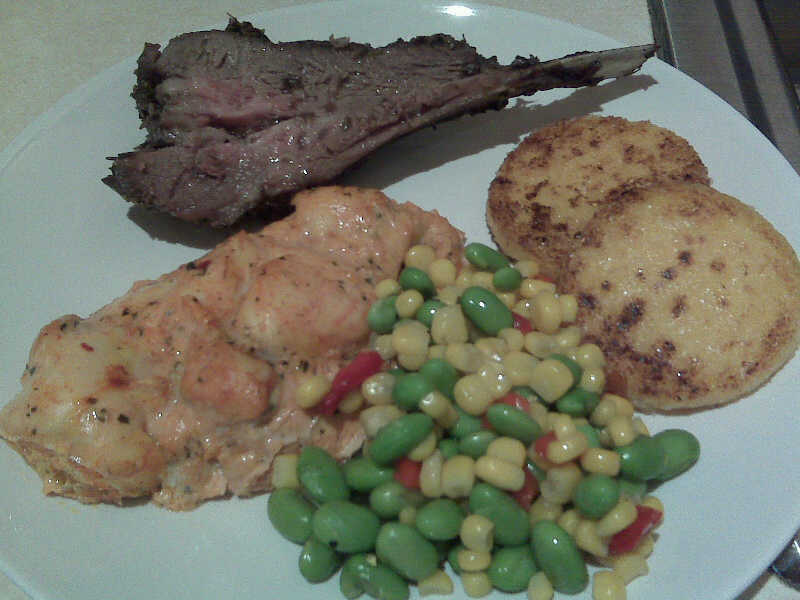 We got pre-seasoned chicken breasts, pre-cooked lamb, polenta, and mixed veggies. 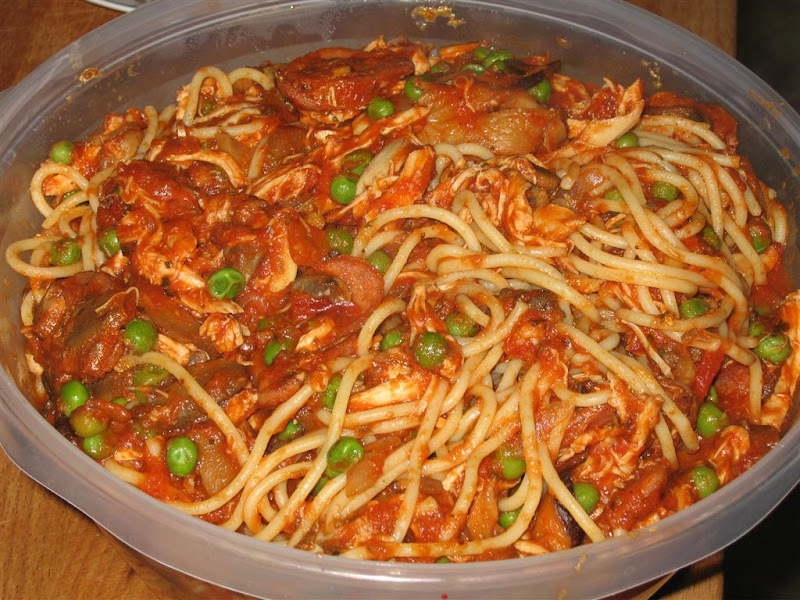 The whole meal took about 30 mins to make and cost less than $30 for 2 persons, with leftovers for lunch. Sorry for the quality of the pictures, they were taken on Ein's cellphone. 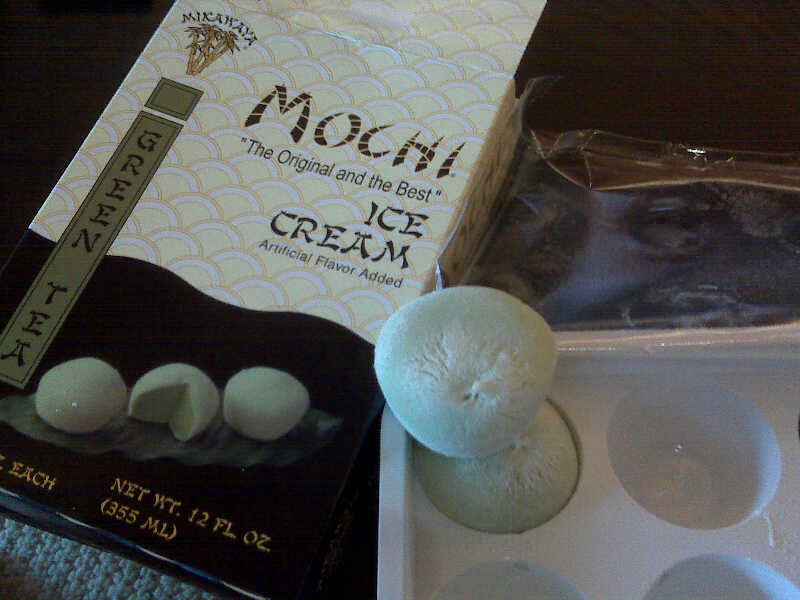 And for desert, we had green tea mochi! Cooking with a friend or for someone is always so much more fun than doing it all by yourself. Was trying to decide what to eat this weekend. I can't stock up too much things cos I only got 2 days at home then I fly out for work again. I had decided on Italian and was going to blow about $60+ on Buca di Beppo which is a pretty good Italian chain. 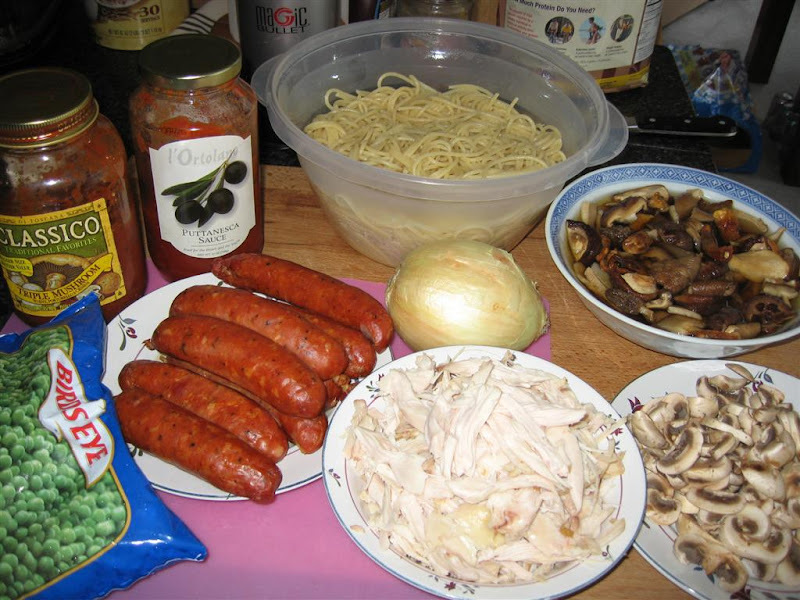 But then I decided it was too expensive and looking in my cupboards and found almost everything I needed to make my own spaghetti. I was only short 1-2 jars of sauce, the rest were leftovers and stuff in my pantry. Aside from saving money, I also got the added benefit of having lots of mushrooms which I love. Oh and I did pop by Buca for some other stuff. 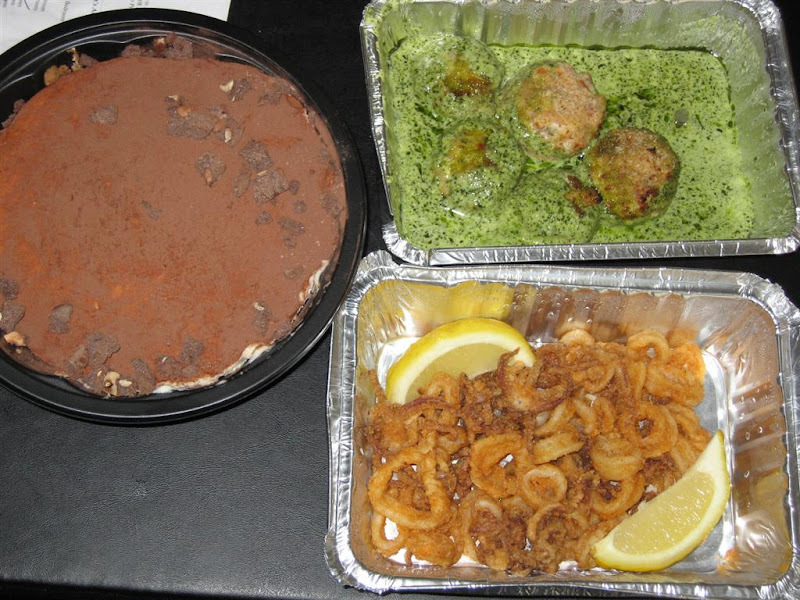 I got Fried Calamari, Stuffed Mushrooms, and for desert, Tiramisu. I love Buca's Tiramisu. I travel to Pittsburgh every Sunday afternoon and fly back home on Thursday nights. But its also crunch time at work and they have us working shifts. So this week and the next 3 weeks I'm working 12 noon - 11pm Mon - Wed and 7am - 4pm Thursdays. I'm ok with this because being a night owl, I actually get more sleep with this shift method and don't have to wake up before 8 or 9am which to me is awesome, plus I get to hit the gym for a leisurely workout. The down side is that computer play time is now almost nil during the work week. And since Thursday is a morning shift coming straight from a night shift, I'm currently dragging a little and need coffee to keep me going. Still it is Thursday and I am flying home so my spirits are high. This weekend, I don't have ANY appointments or tasks that need to be done. It's just me and whatever I wanna do. My toughest choices this week are should I watch "The Happening" or "The Incredible Hulk" or both, and what to eat. 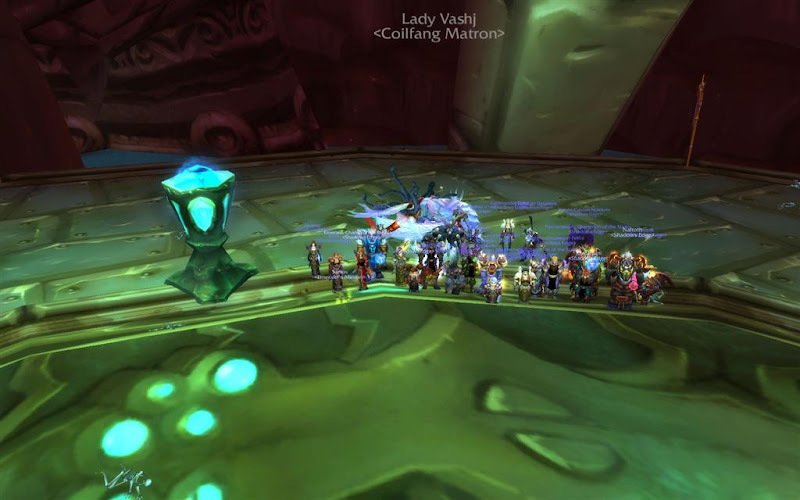 This is not going to make sense to those of you who don't play World of Warcraft, but my guild finally killed Lady Vashj tonight. Lady Vashj is the final boss in a dungeon called Serpentshire Caverns, she's very difficult and on my server (Ghostlands) we are the first Alliance guild to have killed her. How difficult? Tonight it took us 5 1/2 hours and about 7-9 tries before we finally killed her. 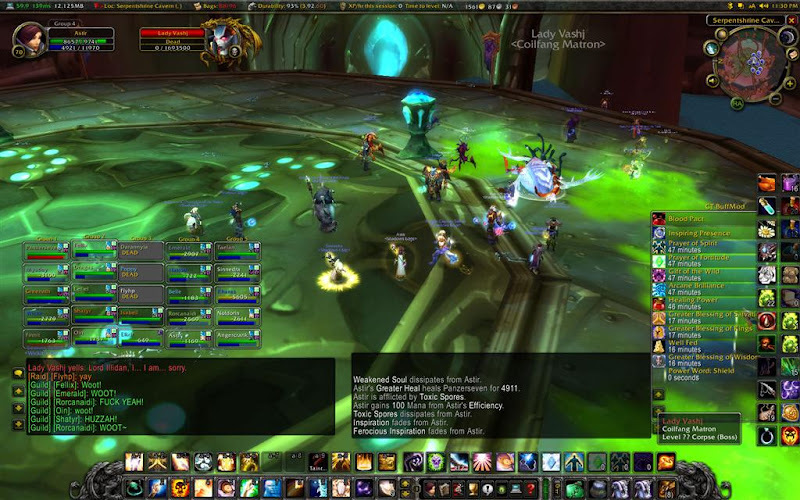 But it was totally worth it, everyone was in extremely high spirits and its a huge accomplishment for a guild that's rated casual raiding. I bought 2 dwarf hamsters back in Sep 2006, Kyle and Kal-El. Kyle was "murdered" by his roommate on Christmas Day, and this morning I discovered that Kal-El passed in his sleep. Hamsters usually live for 24 months, I've had mine for about 1 year 9 months and I've no idea how old they were when I got them, so all in all I think it was about time. 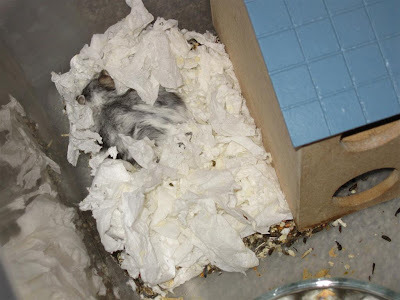 Lessons learnt from this is not to buy Dwarf hamsters again. I like pets that don't bite and dwarf hamsters bite. Also, I think I'll remain petless for a little while, especially since I'm traveling every week for the next couple months. OMG! OMG! OMG! This is hands down the BEST and most FUN movie I've seen all year. 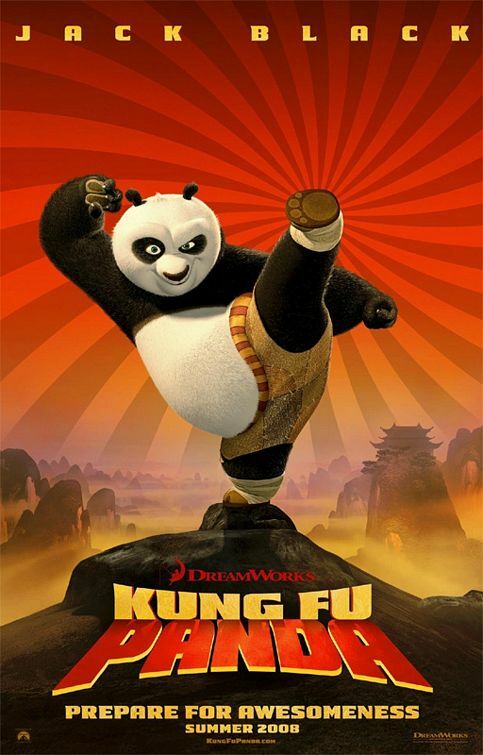 In the past 10 years+, the best animation movies have all been released by Pixar, but no more, Kung Fu Panda is at least as good as Finding Nemo. In fact if I didn't know it was by Dreamworks I would think that Pixar made the show. Its that good. The story is funny as heck and I was laughing throughout the entire show. There was never a moment where I was even a little bored. If anyone is holding back because they don't like Jack Black, don't let that stop you from watching it. 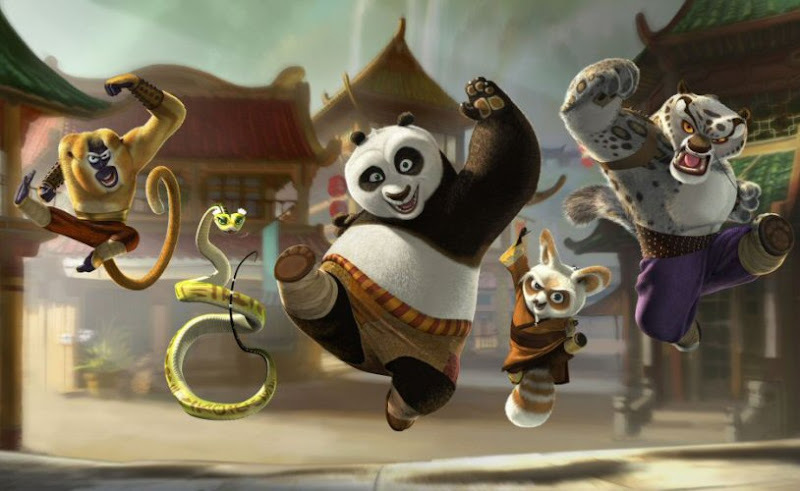 In this show, he's the absolute perfect panda and a main reason the show is so funny. I rate this one a solid 5/5. And if you've got a little one, then this is a must watch for them.